...... give presentations, share photos and videos, and more. But what really sets it apart is the ability to stream the webcam and the desktop screen together at the same time, thus bringing users a new and enhanced sharing experience. In addtion to webcam and desktop sharing ScreenCamera overcomes MS Windows limitation of not allowing a webcam to be used by more than one application. ScreenCamera allows users to split the webcam on multiple applications simultaneously by creating a virtual camera recognized by the system that can be selected as the video source on any number of video enabled programs or websites. Qweas is providing links to ScreenCamera 2.2.3.00 as a courtesy, and makes no representations regarding ScreenCamera or any other applications or any information related thereto. Any questions, complaints or claims regarding this application ScreenCamera 2.2.3.00 must be directed to the appropriate software vendor. 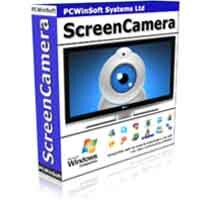 You may click the publisher link of ScreenCamera on the top of this page to get more details about the vendor.